The petitioners, Luther Crowell and Earl W. Godwin, seek to register their title to certain lands (the "premises) in Wellfleet in the County of Barnstable pursuant to the provisions of G. L. c. 185, as amended, namely a large parcel containing about 29.80 acres of beach, marsh and upland shown as Parcel on filed plan No. 35351[A1] (a portion of which has been subdivided and is shown on filed plan No. 35351[A2]) and three small parcels, all shown on filed plan No. 35351[A3] and being Lot 4, Block F and Lots 1 and 4 in Block H (the individual lots). No appurtenant rights are claimed. The land to which the petitioners claim title comprises Area A, lots 1 to 10 inclusive (lots 3 and 4 thereof being said lots 1 and 4 in Block H), Lot 4 in Block F and a portion of Area C on the Decision Plan prepared by the Land Court Engineers and attached hereto as Appendix A. In addition to the respondents named herein the Commonwealth of Massachusetts filed an appearance in the proceedings which now has been withdrawn. The respondents, Katherine G. Boland, Charles C. Zehnder, Ann Zehnder and Ronald G. Eastman, have all entered into stipulations with the petitioners which have disposed of their objections to the registration proceedings. The petitioners also have settled their differences with Bertram C. Arey, Louise B. Arey, and Bernice McKay, but their agreement with these three respondents awaits the disposition of this case for consummation. It would appear that the petitioners also may have entered into a stipulation with the Town of Wellfleet, but it as yet has not been filed with the papers [Note 1]. The sole contest remaining is between the petitioners and members of the Beckerer family. As far as appears, Frank S. Beckerer, III does not claim title to, or any rights in, any part of the parcels claimed by the petitioners, and his appearance has not been considered in reaching this decision. Frank S. Beckerer, Jr. claims title with his father [Note 2] to a portion of Parcel 1 on the filed plan [Note 3] as well as certain appurtenant rights in the land claimed by the petitioners, and with his wife Eloise B. Beckerer with whom he owns Lot 2 in Block A on the Tully Crosby Plan (shown as Lot 2 on Appendix A similar appurtenant rights in the premises sought to be registered [Note 4]. Mrs. Beckerer, also a respondent, claims the same rights. The premises shown on the Tully Crosby Plan are denominated Area B on Appendix A and are outlined in red thereon except for Lot 1 on the Tully Crosby Plan which comprises a part of Area C and Lots 3 and 4 thereon which are without the colored outline. The Beckerers also raise questions as to whether certain areas of the premises are below mean high water and constitute a public beach and parking area. It is for The Commonwealth of Massachusetts and the Town of Wellfleet, however, to represent the interests of the public in such matters. The proceedings were tried in the Land Court on November 20, 1974, December 21, 1974, February 26, 1975 and February 27,1975. A view was taken by the Court on September 26, 1975; final arguments were made at the Court on November 18, 1975. Both petitioners and respondents submitted briefs. At each day of the trial a stenographer was appointed to record the testimony. All exhibits introduced into evidence are incorporated herein by reference for the purpose of any appeal. The only contested issues remaining in the case are (a) whether the petitioners have sustained their burden of proof in establishing their title to Area A, the strip of land between mean high water mark and the westerly line of the land shown on the Tully Crosby Plan and to so much of Area C as lies without Lot 1, Block A and Bay View Avenue on the latter plan; (b) whether the premises are subject to a right of way for the benefit of all those entitled, including the respondents Beckerers, in the vehicle tracks shown on the A plan and running from Old Wharf Road across Lot 1 on Appendix A, land now or formerly of Lewis Stone [Note 5] and Lot 2 on Appendix A to the Beckerer land and the small parking area at the westerly end of the track, as shown on Appendix A", with access from the houses within the Tully Crosby subdivision to the vehicle tracks; (c) whether the premises are subject also to the rights of others entitled to use the parking area; and (d) whether said Lot 1 also is subject to a right of way for the benefit of the owners of lots shown on said sub- division from Old Wharf Road across Lot 1 to the traveled ways within the old subdivision [Note 6]. There were two further issues which were raised at the trial, but which are not in fact involved in the present proceedings. Owners of lots within the Tully Crosby subdivision were concerned that the petitioners were claiming a right to use the ways as shown thereon. It was apparent both from the testimony and from the view that the actual location of the traveled ways within the old subdivision do not follow in any material respect the paper streets shown thereon. This has been true for well over twenty years if not indeed from the time the first lots in the subdivision were sold. The petitioners, however, have not claimed, as appurtenant to any of these premises, the right to use the streets in the old subdivision plan other than Cross and Beach streets from the individual lots northeasterly to Old Wharf Road, and accordingly the question of appurtenant rights within the old subdivision need not be considered further. The other issue which is of major importance to the respondents Beckerer but which appears to be without the present proceedings concerns the relocated access road to the Beckerer premises. Rights in the vehicle tracks shown on the filed plans will be dealt with later in the decision. The respondents Beckerer claim, however, that such tracks frequently are impassable during high tides and that therefore they have rights in an alternate access road which they constructed northwesterly of the vehicle tracks. There has not, however, been any showing that this road is situated on any part of the land claimed by the petitioners. To the extent that it in fact is so located, the testimony of the respondents was clear that this alternate way was not used until 1959; thus the acquisition of any right by prescription has not been shown, the necessary twenty year period not having yet run, and indeed having been stopped by the filing of the present registration petition in 1967. Baumgartner. v. Doherty, 286 Mass. 583 (1934); McMullen v. Porch, 286 Mass. 383 (1934). There has been no argument made by the respondents that the common ownership of the Tully Crosby subdivision and the surrounding peripheral land gives rise to an easement by necessity in this location. However, any argument to this effect would fail since alternate means of access have been used over the years by the respondents predecessors in title. The house on their premises easily predates 1930, but it has only been within comparatively recent years that the "high tide access was used. Previous to this the premises were approached from Bay View Avenue or over the way shown on Appendix A. In an appropriate case there may be an instance where the changing forces of nature will lead to a "springing easement by necessity although there are on the face of it obvious difficulties with such a theory. In any event, this is not that case [Note 7]. The petitioners' claim to this portion of the locus is based on a deed from Edwin P. Cook to Robert W. Howard dated September 16, 1889 and recorded in Book 181, page 510 (Abstract Sh. 62). The respondents also claim under the same predecessors in title. At the most this deed conveyed an undivided one-half interest of record; even this interest was suspect at the time of the conveyance, but Cook thereafter did acquire such an interest. As to it the application of the doctrine of estoppel by deed seems patently appropriate. See Peck v. Harvey, et al., Land Court Case No. 6857l Misc. in Equity. As to the other one-half interest no party to the proceeding has been able to trace those holding it of record. Robert W. Howard, appears to have assumed that Cook had conveyed the entire interest in the premises to him, for after this conveyance he had Exhibit No. 24 prepared and recorded. He then proceeded to sell lots as shown on the plan. Thereafter, in many instances cottages were built on lots in the subdivision, and title to them and appurtenant rights to use the ways shown on the plan and connecting links to Old Wharf Road were acquired by adverse possession. The preparation and recording of this plan also constituted a claim to the perimeter land. that part of Area C without Lot 1 on the Tully Crosby Plan and without Bay View Avenue". Hopkins v. Holcombe, 308 Mass. 54 , 56 (1941). The deeds out to these lots including Lots 1 and 2 owned by the Beckerers all bound on the west by the top edge of the bluff as shown on said plan. The bluff appears to be located today approximately where it was when the Tully Crosby- Plan was prepared except at Lot l where there no longer is a bluff and the elevation above sea level is only a matter of feet. Whether this is due to erosion by the sea or simply illustrates an error in Exhibit No. 24 has not been shown. There can be no doubt, however, that the owners of the lots on the subdivision plan have made use of the bluff and beach for the erection of stairs, boardwalks and piers and by the use of the beach for all customary purposes. (See Exhibits 23[D] and 23[E] which illustrate the situation on the ground many years ago and show a typical use of seashore property by the abutters.) Mr. Beckerer testified as to the use he had made of this area of the property in the years since title was acquired to Lot 1 by the Beckerer family. Each spring he has planted the bank with sea grass and has lined the entire front of the bank with sea weed to protect the house from the ravages of the ocean. His predecessors in title also did the same. While this activity has not been carried on by the Beckerers for sufficient length of time to establish title by adverse possession, their use may be tacked to that of their grantor, the two ownerships covering a period well in excess of twenty years. The petitioners admit that the Beckerers have title by adverse possession to the rear of the premises shown on the filed plan in Case No. 34798 where the converted garage serves as a guesthouse; while there was no similar express admission to this effect as to the front of the Beckerer premises where the A plan shows a line passing through the Beckerer front porch, the respondents Beckerer in an appropriate proceeding may be able to show title by adverse possession to an area between the sidelines of Lot 1 extended to mean high water. Testimony of the petitioner Crowell as to any adverse use by petitioners of the area between the bluff and mean high water was sparse. Claim of ownership in this particular area rests primarily on efforts to secure use of the beach for tenants of' other summer properties owned by the petitioners. When due weight is given to the flaws in the petitioners' record title, the use made of the area by the abutters and members of the general public and the absence of strong evidence of adverse possession by the petitioners or their predecessors, I find and rule on all the evidence that the petitioners have failed to prove that they have a registerable title to so much of Parcel 1 on the A plan as is shown on Appendix A as Areas "A and "C". Lot 2 on Appendix A" is subject to the same title infirmities as the beach, but no party having pursued any evidence of title adverse to that of the petitioners and the petitioners having introduced some evidence of adverse possession to supplement their record title, I find and rule on all the evidence that the petitioner have borne the burden of establishing registerable title to Lot 2 on Appendix A. The petitioners' title to both Lots 1 and 2 on Appendix A is, however, subject to the rights of all those entitled (including the general public) to pass and repass, on foot and in vehicles, over the way shown on Appendix A and to park vehicles in the parking area shown on Parcel 2 during customary periods of time (such as from dawn to dusk) while engaging in fishing, boating and bathing but not in other activities which partake of the nature of a nuisance. The public, as well as private parties, may under certain circumstances, acquire prescriptive rights to engage in these activities. Attorney General v. Ellis, 198 Mass. 91 , 98 (1908). On all the evidence I find and rule that such prescriptive rights of the public have been shown. Title also is subject to the rights of those owning lots in the Tully Crosby subdivision to pass from the relocated Bay View Avenue, (not shown on Appendix A) to the way on Parcel 2. The Court finds and rules that among those entitled to use such way are the respondents Beckerer as appurtenant to Lots 1 and 2 in Block A on the Tully Crosby Plan. Title to Lots 1, and 3 to 10 inclusive, on Appendix A is not in dispute. However, the Abstract (Exhibit No. 2) prepared by the Land Court Examiner (now deceased) sets forth two deeds from the petitioners to third parties conveying Lots 1 and 6 on the filed plan No. 35351[A2] [Note 8], and it may be that when the required supplemental report is filed with the Court, the conveyance of other plots on said plan will be shown. The present owners of such lots may be substituted as petitioners as to their lots upon the filing with the Court of the appropriate motions and payment of the required filing fees; if this is not done within sixty days after the last to occur of the entry of this decision, final disposition of any appeal therefrom and notice by the petitioners to the record owners of said lots, this petition will be dismissed as to any such lots which have been conveyed to third parties. Parcel 1 on the filed plan is subject to a right of way for all purposes, as appurtenant to the lots in the Tully Crosby subdivision, from Old Wharf Road to the traveled ways within the subdivision. This is so by necessity, implication, and prescription. It does not appear, however, from the filed plans where the way is located by which access is afforded to the existing houses. The petitioners are hereby directed to have a registered surveyor furnish the Court with a plan satisfactory to the Land Court engineers and tying access within the Tully Crosby subdivision to Old Wharf Road and showing also the access from Bay View Avenue to the way on Lot 2 on Appendix A". The petitioners claim title to three lots within the subdivision of which one lot is Lot 4 in Block F. The abstract, however, sets forth a conveyance of this lot by Robert W. Howard to Arba G. Stearns by deed dated July 6, 1891 and recorded on July 14,1891 in Book 197, page 222 (Abstract Sh. 89). There is no record of a reconveyance of said premises to the grantor. Prior to the Stearns deed Robert W. Howard, by deed dated February 24, 1891 and recorded in Book 196, page 91, conveyed the same Lot 4 to Nathan Edward Noonan by deed dated February 24, 1891 and recorded in Book 196, page 91 (Abstract Sh. 76). Noonan thereafter reconveyed said lot to Howard by a deed which was dated before that to Stearns but not recorded until thereafter (Abstract Sh. 105). Since the petitioners claim by inheritance from Mr. Howard, the principle of estoppel by deed should apply to the conveyance to Stearns. As to Lot 4, therefore, the Court concludes the petitioners do not have title sufficient to entitle them to registration. The petitioners may have intended, in amending their petition of March 23, 1973 to include Lot 4 in Block F and in filing their motion to sever and dismiss as to all land included in the petition other than Parcel 1 on the filed plans and the three small lots hereinbefore mentioned to refer to Lot 5 in Block F rather than Lot 4. The outlining on the filed plans suggests this to be the case as does the Examiners report. However, the motions filed on behalf of the petitioners are clear and the citation in the case includes only said Lot 4. At this stage of the proceeding in a contested case it would seem that the only remedy of the petitioners as to Lot 5 is to file a separate proceeding to register and confirm their title as to it. It should be noted that the easterly part of the premises also comes from Edwin P. Cook who again had only an undivided one-half interest of record as to it. It seems apparent, however, that the identity of the holders of the other one-half interest in the locus which is missing of record has been lost in antiquity. It stems from a deed executed by John Withrell dated September 20, 183l and recorded in Book 5, page 212 conveying an undivided one-half interest to Leonard Battell and Robert E. Little and a like interest to Richard Arey. The latter interest descended in, something less than perfect form to the petitioners. Those entitled to the other one-half interest are unknown and may be assumed to have abandoned any claim they otherwise might have had. The interests of all concerned would appear to be best served by the present disposition of the case. 4. So many of Lots 5 to 10 as a Land Court Examiner's report to be filed with the Court within twenty days after the entry of this decision shows to be held of record by the petitioners. As to any lots conveyed to third parties, the present owners thereof shall be afforded an opportunity to file a motion for partial substitution as hereinbefore provided. [Note 1] This may well relate to a revised layout of Old Wharf Road. The 1927 layout, 16 feet wide, is shown on the various filed plans, but the A and A plans also show a proposed twenty-four (24) foot increase in width. Appendix A shows only the vehicle tracks in the approximate location of Old Wharf Road. [Note 2] An appearance, but no answer, was filed on behalf of Frank X. Beckerer. Title to Lot 1 in Block A on the so-called Tully Crosby Plan dated 1890 and recorded with Barnstable Deeds in Plan Book 33, page 29 (Exhibit No. 24) was taken in the names of Frank X. Beckerer and Frank S. Beckerer, Jr., as joint tenants with right of survivorship by deed dated August 6, 1959 and duly recorded in Book 1050, page 330 (Exhibit. No. 28). It is not clear from the testimony, however, as to whether Frank X. Beckerer is still alive. Unless the context otherwise requires, all references herein are to the Barnstable Registry of Deeds. 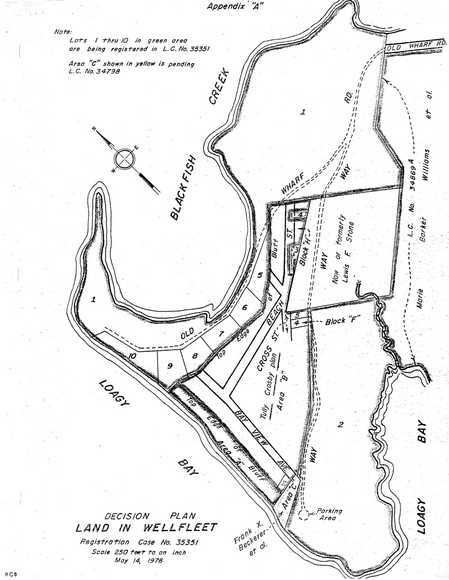 [Note 3] Area C on Appendix "A to which Mr. Beckerer seeks to establish his title encompasses (a) Lot 1 in Block A on the Tully Crosby Plan; (b) a part of Bay View Avenue thereon; and (c) that portion of the said Parcel 1 on the A Plan claimed by Mr. Beckerer. There is no dispute as to the title to the Beckerers' Lot 2. [Note 4] The deed to Mr. and Mrs. Beckerer is dated October 28, 1968 and is recorded in Book 1440, page. 1194. [Note 5] Efforts to locate the heirs of Lewis F. Stone were made in Registration Case No. 34869, and were without success. [Note 6] The detail of the Tully Crosby subdivision showing the lots and streets is not shown on Appendix "A but merely the outline thereof. [Note 7] It should be pointed out that the topography of the area is such that Bay View Avenue drops off steeply at its southerly end as shown on the Tully Crosby Plan and would appear to be impassable by an automobile in that location. Some of the property owners on Bay View Avenue have relocated the southerly end of the street so that it crosses Area B". Any rights in the relocated street are not properly an issue in this proceeding. [Note 8] These lots also bear the same numbers on Appendix A.